Life is a series of up and down. Friends, work, school, life, family, sibling, personal demons, these are all things in life that can bring you up, or down. As they say when life gives you lemons, make lemonade. Or you can walk away and give up your dream of owning a lemonade stand and move on. Where some people live off hope, others give up on it. Kate Brown’s life is heading towards the ground, and the only way she seems to stop it, is to give up. Or is it? Kate’s father took the sign of his broken desk as the perfect opportunity to quit his job. Taking up his passion of selling vitamins label “Perfect You” at the mall for a living. As you might guess, it is not doing well. Not able to pay employee’s, her father hired Kate and older brother Todd as employees, forcing Todd to work during the day, and Kate to work after school. As her family slowly goes poor, that is not even the main problem in her life. Her best friend since forever had left for the summer and came back skinny, tan, blonde and pretty much perfect. Her social status sky rockers as she starts dating her all time popular crush Sam, and hanging out with all the other popular girls. Soon Kate is invisible in front of Anna’s eyes, and Kate has no idea why. Then there is Will. Do you ever have that incredible cute popular boy who is completely annoying, and yet you cannot stop from loving him? Well that’s Will. Even though Kate want’s to hate him, when he starts showing interest in her, well a girl can only resist so much. Kate life is going fast with her family, friend, and Will drama, Kate loses hope and stops caring. If only she knew that even though life is not perfect, good thing can happen, but only you are willing to let them in. 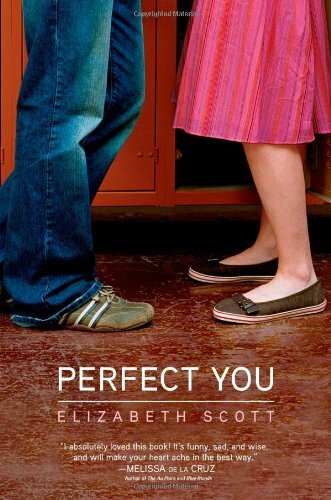 Elizabeth Scott tears a new one with this young adult romance novels. She takes a struggling family and makes it even worse, until it broke. Add a loss of a best friend and boy drama and you get a teenage girl nightmare. I loved this book for the simple fact that nothing was clear. Did Will truly like her, or was she just another hook-up? What in the world is going on with her parents? And did Anna really miss her, or did she just want someone she doesn't have to be perfect around? This book had a total of thirty-seven chapters and I was honestly scared that it was going to end with a cliff-hanger. The book goes all the way up to thirty-six with the beginning of the downhill from the climax. The all of thirty-seven in sort of an epilogue but not really. The witting is good and the book is a little short (282 pages). Yet I loved this book as I could really connect with Kate and the struggles she was going through it. Perfect You was a perfect name as the book starts off explaining why the vitamins ruin her life, but in the end she was not so hateful towards them. It is not a series, but by itself as some books should be. I would recommend this book for teenage girls for it is truly a worthwhile read. There is only so much drama a girl can take.